This story is from WDIFL fan Junji Nakamura and although it's not about a dragster per se, it is a recounting of a familys drag racing experiences in the late 50's and early 60's in Long Beach, California at Lions Drag Strip. Even with a bad ending, it still refects on what the mind set was for the kids of that era andtheir love of the sport. I'm guessing many can relate. After several years of racing our stock 1958 Chevy Impala in the A/Stock car class at Lions, we decided that our old 348/280 HP car could not compete with the bigger 335 HP+ cars from 1959-60. So, we decided to find a car that could compete in the gas coupe, street classes. We wanted something other than a standard Ford Coupes /Sedans, which was pretty much a standard hot rod everywhere. We found a 1940 Willys coupe sitting in a side yard about an equal distance from our house and the Lions Dragstrip. We made a deal with the lady who owned it and towed it home. The body was well preserved and had no rust anywhere. It was completely stock, but showed signs of non-use and surface tarnish on the paint. We immediately began to smooth out the old paint and sanded it smooth for a fresh coat of primer. We tried as best as we could to fire up the old motor, but it was thrashed. The front fenders were taken off and the motor was removed. We knew a SBC motor would fit easily into the compartment, but noticed that others moved the motor back a few inches to still be legal for the street C/Gas class. We removed the stock firewall and installed a steel replacement, smooth sheet, back a few inches so the SBC would fit, including the distributor sticking up at the rear of the motor. The front was cleaned up and painted. We purchased a complete 56 Chevy rear axle set up for the back end. The Chevy rear axle set up came with a 4:11 Positraction gear ratio and springs. The 58 Impala had 4:56 Positraction gears, so the swap could be made easily if needed. We knew of a small local, speed shop that had a 283 SBC running 6 Strombergs and an Isky cam that was for sale. Other than the cam, it was stock. So, that motor was installed along with a LaSalle 3 speed transmission. The legal two piece scatter shield was also installed. We had a local machine shop make a driveshaft to fit. The final rear suspension add-on were the Traction Master Bars. The brakes were upgraded and lines were replaced all around. The Hedman Headers were coated and folded neatly down and out to connect with standard exhaust running just past the tube mufflers. Our 40 Willys was not a finished show car like the top racers. We were just starting out and our thought was to get the car put together with whatever we could afford. Run it first to get it right, then, get all of the finishing stuff later. Our goal was to go to the 1960 U.S. Nationals at Detroit in September. We tried to find the best parts for our SBC. The car was not painted a flashy color, but we spent time spraying a red primer to keep the body from rusting. The steel wheels were painted black. All of the stock chrome accessories and bumpers were polished. It looked like a street car, which it was to be legal. The interior had two foreign car bucket seats. The floorboards were not rusty and were in good shape. We put in an approved two piece scattershield over and under the bell housing. Then, we installed the 2 gallon aluminum Moon Tank with a pump, in the passenger side of the cab. (this was approved by the safety committee at the time) all of the windows rolled up, the wiper motor was in place and the headlights and brake lights worked, just like a street legal car. At first, the SBC motor ran the stock distributor and coil. It started up and ran well down our Long Beach neighborhood street. (street legal with a license and mufflers) The car shifted well and left from a standing start with a chirp thanks to a 4:11 Positraction Chevy rear end, Traction Master Bars, and Bruce Slicks. 120mph. But, they were supercharged. Our idea was to get down to the C/Gas class where we would be close to and had a chance at the national record. This was from April to June of 1960. The car ran consistently at this time and speed. So, our next idea was to go larger with the SBC and possibly get a supercharger, but that would keep us in the B/Gas class with more horsepower. We stayed in B/Gas for a short time and then decided to meet the requirements to be in the C/Gas class. So, over the last weeks, we had some steel plates welded into the trunk floor to support the trunk floor, make it stronger and of course, put weight over the rear wheels. With the additional weight of the thick plates and water in the stock gas tank, we qualified for C/Gas, our intended goal. But, the lure of going faster was making an itch that we could not displace. So, we decided to go with more speed stuff that we could still afford. We found out that we could go to 292 SBC with a supercharger and still be in C/Gas. So, a little more horsepower with the same weight car should give us better results. Since we had just put the car together early in the summer, we were not ready to compete against the big name racers in the B/Gas class. They were sponsored, had unlimited money to spend on go fast stuff and had much more powerful motors and speeds. So, our challenge was to set the speed and E.T. records for C/Gas. The times we turned earlier in the summer showed us that we were getting close to the C/Gas record as far as top speed, but we were a little off in the E.T. The SBC motor was just brought back from getting bored out to equal 292 and we had just purchased some Jahns Pistons for it. We went to a diesel shop in Wilmington to buy a new 671 supercharger, but they were too expensive, so we settled on a slightly used one off of a test motor they had. We took the heads and the 671 blower to Reath Automotive to be spec'd out, ready for competition. We had just received a new 671 blower drive kit from Edlebrock and Weiand to complete the set up. New aluminum finned valve covers, Moon Aluminum breathers, coated the Hedman Headers with high temperature paint and adjusted the Joe Hunt Vertex Magneto to fire. My brother, James, was a Howard Cam fanatic. He liked the look and attitude of the cars/guys running Howard Cams. So, he bought an aluminum flywheel, a trans adapter and a full race cam lifter kit for the new SBC. We finally had the motor back together and on the first start up, it sounded outstanding. A few adjustments later, we were out cruising the neighborhood in this fully street legal race car. We tried going over to a friend's house, but were unsure of how much mileage we could get with the small Moon tank. Finally, after several 4-6 mile runs, we estimated that we could go about 12 miles, 6 out and 6 back with the small Moon tank. We took it over to the small shop where we originally got the Stromberg powered SBC. They were impressed with the huge 671 on the SBC. They knew the 671's were coming for the SBC, but never saw one in action. The car ran great, it pulled well in all gears and we felt it was ready for the C/Gas Class competition at Lions. 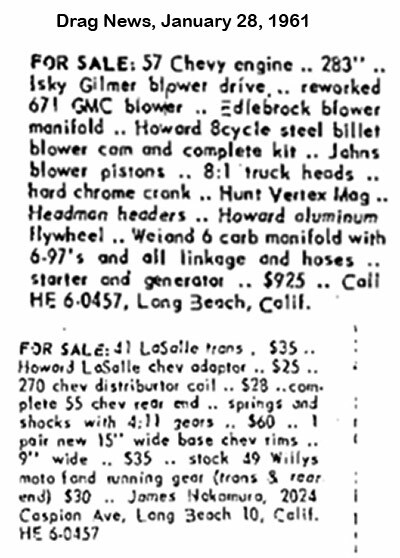 It was August 13, 1960 and near the end of the summer racing season at Lions Dragstrip. My brother and I were excited as we finally got the 40 Willys to run right, after spending the last several weeks tuning and making adjustments. We loaded up the cars and started the short tow to Lions. We were running with the 292 SBC/671 with Strombergs and the car was weighed in to meet the C/Gas class rules. We were an interesting Willys race package as no one else in the pits had a 671 on a SBC, especially with 6 Strombergs on top. We set up all of our stuff, changed the rear tires to the Bruce Slicks, put gas in the small Moon Tank, and fired it up for the first time in the pits. With all of the other top racers in the pits, our little homemade Willys was just another car, but when we opened the hood and fired up the motor, people were interested. My brother was proud that our car drew such a crowd. The first afternoon run with this new motor showed promise as it hit low 13's. Then next run provided a high 12 sec run. We won several elimination races and were very happy for this first time outing. The times were in the mid 12's. The excitement on this day was building for us because we were so close to doing something that was one of our original goals in drag racing. (to set a class record in speed and e.t.) At 9 pm, We were finally in the last race for the C/Gas trophy. It is just a trophy, but it meant something to us as it was an accomplishment for our efforts. The guy in the next lane was the perennial class champion and was pretty much unbeatable. There was a little tension in the staging lanes, waiting for our turn. We talked about what it would take to beat this opponent and my brother just said that he would be fast off the line. Fast was an understatement. When it was "go-time," my brother jumped off the line and was at least a 1.5 car lengths ahead. We (Atts Ono and I) were standing next to the 58 Chevy tow vehicle and was amazed at how fast my brother got off the line. We were starting to yell and congratulate each other. By the time he was past the tower, the lead was over two car lengths. We kept hoping we would see his taillights come on soon. All of a sudden, we saw a flash underneath the car, light up the interior and within seconds, the driver's door opened with more flames shooting out. Everyone at the starting line was puzzled and worried. The next few seconds was amazing as the car veered right and continued on to the fence, with fire coming out of the cab of the car. We jumped into our 58 Impala and raced down the strip. Little did we know that we passed up my brother lying on the tower side gravel, past the traps, with people attending to him. We raced directly to the burning Willys wedged into the fence. There were a couple of guys spraying extinguishers on the car and we did the same. The multiple extinguishers were useless as the fire was raging. I thought my brother was still in the car and tried to open the door. I was pulled away and told that he had jumped out right after the timing lights and was back on the other side of the dragstrip. Atts Ono told me to go back to see my brother and that he would take care of the burning Willys. By the time I drove back, my brother was being loaded onto the track ambulance for a trip to the Long Beach Memorial Hospital. I did not see him again until I took my parents to visit him that night. Giving my parents notification that my brother was in a drag racing accident and that he was in the hospital was the most heart wrenching thing I ever had to do as a teenager. My mother was going crazy with fear. Upon reaching the emergency room at the Long Beach Memorial Hospital, we saw my brother lying on a bench all covered with moistened gauze. The doctor told us that he had 3rd degree burns over 30% of his body. He was almost unrecognizable laying there on that table. Of course, the first thing he said was, "How is the Willys? Can it be fixed?" Our mother was aghast at that statement. The doctor said that the helmet saved his head from hard knocks when he jumped out of the car. But, his jacket was melted off his right arm and shoulder. It was a bright yellow and red, Wynn's Friction Proofing, nylon, bomber style, jacket that was our favorite. The following Sunday, Atts Ono and I went back to Lions to see what happened to the 40 Willys. The car was a burned out hulk. The fire did a complete burn and melting of the interior. The seats were just wire and metal, the moon tank was gone, survived by a couple of nuts and bolts in the floor, the glove box door was half gone into a melting mess, etc. The worst thing we noticed was that there were metal chunks wedged into the top of the dash, near where our tachometer used to be mounted. The doors also had metal pieces wedged into the window sills. There was a huge hole in the floorboard where the scattershield just flew out somewhere. We never knew where it went. It was a scary sight to see such destruction in the bright sunlight. We moved the car onto a trailer and towed it back to Atts Ono's house. My parents would have gone berserk at the sight of the smashed in, burned out Willys. So, we spent the next several days disassembling the Willys at his house as much as was possible. Most of the driveline was salvageable as was the 671 SBC and transmission. We took all of the parts off and trailered the burned out hulk to a scrap yard near Lions for disposal. There were other items we could have saved, but being weary about keeping such destruction for later use bothered us. The car parts we (Atts Ono and I) salvaged that next day, sat idle in our backyard garage room for a long time. But, within the next 6 months, we sold everything from a Drag News Ad. The 671 SBC motor went to a racer from the Midwest somewhere and the rest of the stuff was sold to local racers. (see ad below) So, this ended our involvement in drag racing, as my brother had a difficult time getting back into his favorite activity. In the 1.5 years of rehabilitation, he turned his interests back into surfing and was looking into racing motorcycles in the desert Hare and Hound races for the next motorsport activity. One good thing came out of this tragic accident, the Lions Safety Committee made it mandatory that all Aluminum Moon Fuel Tanks be immediately moved out of the cab of all vehicles within two weeks. Atts Ono moved his Moon tank out of the cab and installed it in front of the radiator in his new 40 Willys build. Drag racing was and is a tremendous activity for those involved in it. It gave us a direction and goals that started us off in making decisions to be used later on in our lives. We will forever be grateful for those early years spending time in our backyard garage, the local hot rod shops, and at the dragstrip. And for my brother, James, who passed away too early at 52 years old. Thanks for the memories and help growing up.